The process of sampling the ocean bottom for surfclams and quohogs isn’t as easy as it sounds. Both of these animals live below the surface of the ocean bottom and that ocean bottom can be sand, mud, or contain a large number of rocks. To get to the clams the dredge is lowered into the water using a large crane and cable. Once on the ocean floor, a pump directs the edge of the dredge into the sand/mud and at the same time blows back anything collected into the back of the dredge. The entire time the ship is moving, dragging the dredge along the bottom. The idea is for the clams and other larger samples to remain in the dredge while mud and sand wash out the sides and the back. This works most of the time but occasionally we have brought up the dredge filled with grey sticky mud or large amounts of sand and rocks. We can put the dredge back into the water off the stern (rear) of the ship and wash away some, but the sticky grey mud has caused problems and we keep our fingers crossed each time the dredge comes up. Before sending the dredge down, three sensors are loaded onto the top and side. These are similar to flash drives that collect certain data such as water depth, temperature, and tilt. This data is retrieved and downloaded into the computer after each “event” (the term used for each sample). I’ve been trained on setting up the event using the computer in the bridge. It requires communicating with the NOAA Corps officers who are on the bridge navigating the ship. These people work closely with the winch operator who is lowering the dredge into the water at designated points. NOAA Lead Fisherman Todd Wilson is responsible for operation of the winch that lowers the dredge. 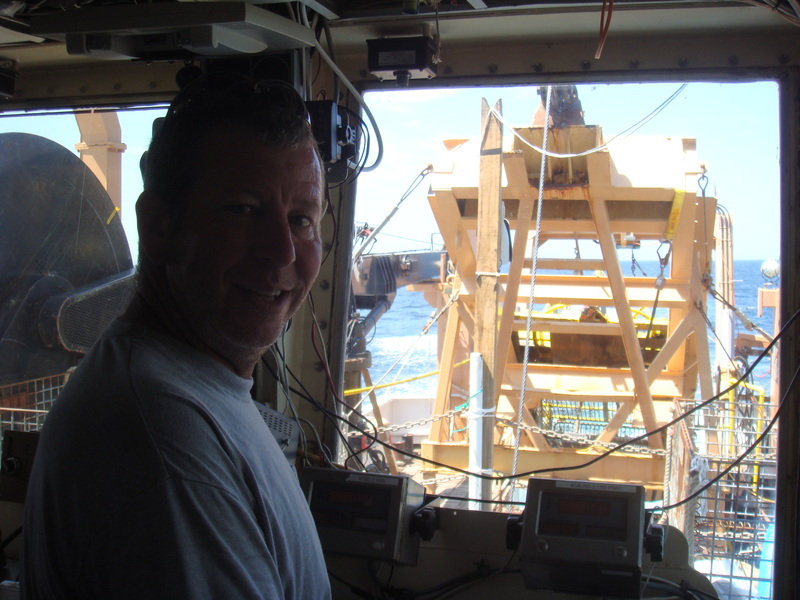 The winch operator is also in direct communication with the crew on the deck who assist in lowering and raising the dredge and providing for a safe working environment for the volunteers and scientists. Because of all the heavy equipment on the deck, we are all required to wear hard hats when on the deck. Of course, we also wear our life jackets. 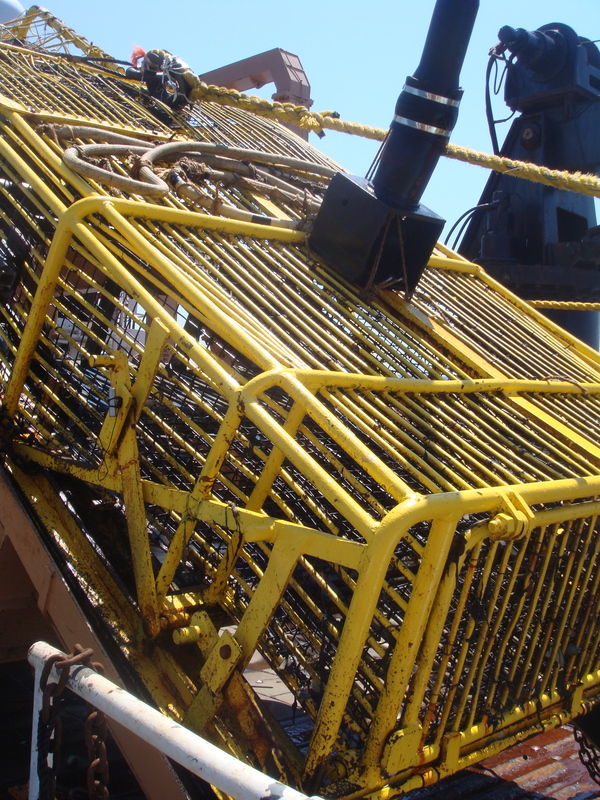 The process of lowering and raising the dredge in specific areas is highly technical and one that is worked out well in advance of each sea trip. 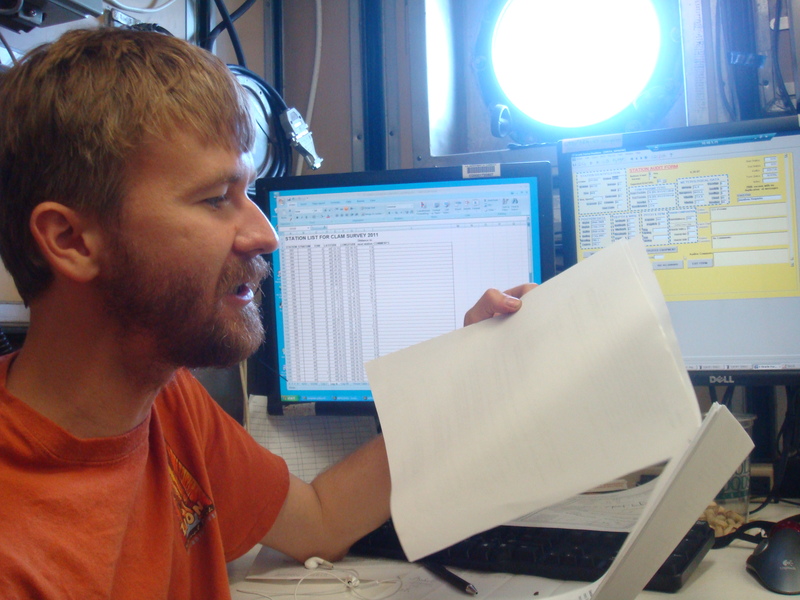 Once at sea, it is the job of the Chief Scientist (Jakub Kircun) to monitor our sampling sites. 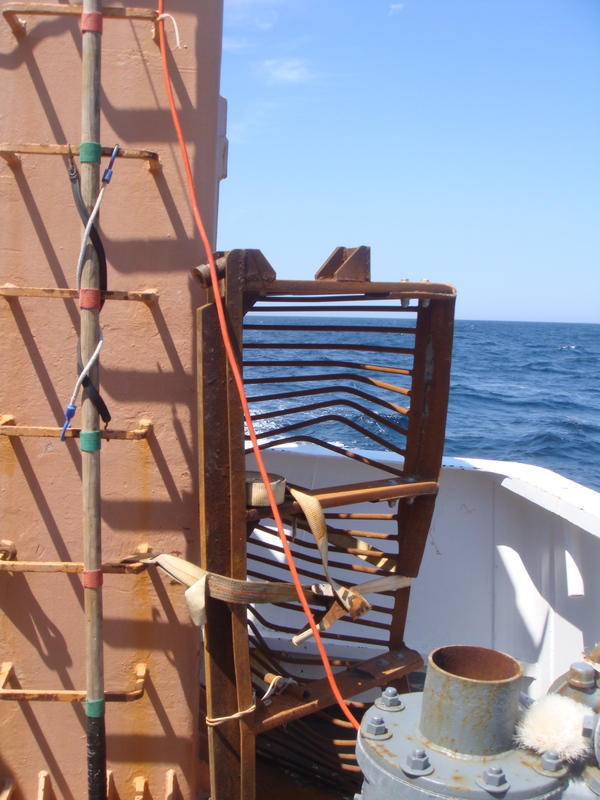 Occasionally we have to make adjustments, such as yesterday when the blade assembly of the dredge was damaged by rocks. The broken blade apparatus that had to be removed from the dredge and replaced. We had to stop our work for almost two hours while the crew removed the damaged part and replaced it with a new one. This happens with some regularity so the ship carries extra blades and blade assemblies. There are only two more assemblies left (of the part we replaced yesterday) and approximately three more weeks of sampling. I asked what would happen if we ran out of blades and/or blade assemblies and was told the last leg (the last two weeks of sampling) may have to be cut short. If possible, the crew may try to repair the broken part. I’ve gotten to know my fellow team (those of us on the noon-midnight shift) through our long hours on deck and in the lab. Two of the volunteers are like me – here for this particular leg. Brenna O’Neill is a graduate student at the Florida Institute of Technology and works in marine sciences. Henry Hope is a NOAA employee who usually works in a lab in Woods Hole, MA but volunteered for this trip to see what kind of science we did at sea. The other members of our team are all NOAA employees – either working continuously on the ship for all the science expeditions or part time on the ship and part time in a lab. I was surprised to find out that there are various science expeditions carried out all year long – including in the middle of winter. One of the crew told me of working on deck having to chip away ice from the equipment before it could be used. It’s been so warm and humid on this trip I can’t imagine being that cold. In fact, I brought several sweatshirts and jeans with me thinking it might be cool out at sea but haven’t even looked at them since I arrived. It’s been all t-shirts and shorts even at midnight. Last night we had another 2-hour delay because of a lightning storm – this time we DID hear the thunder!